Starting in the 2017–2018 school year, Macalester will join its Minnesota peer Carleton and 36 other colleges and universities around the country as a partner with the QuestBridge program. This decision, recently solidified during this semester’s Board of Trustees (BoT) visit to campus, is a first for Macalester, which has not partnered with any similar organizations in the past. Both Shay Gingras ’17 and MCSG President Merrit Stüven ’17 sit on the committee that first approved the decision, the BoT’s Admissions Committee, as student representatives. QuestBridge, Gingras explained, has a highly specific focus aimed at reducing unequal exposure and improving access to America’s high-tier colleges and universities. “QuestBridge identifies qualified, very high-achieving low-income students in high school; there’s a college prep aspect to it… and they help provide potential applicants [with] testing resources. They target low-income students who are less likely to apply to ‘reach’ schools,” Gingras said. Macalester, which decided on QuestBridge after weighing multiple other programs, will be receiving eight students each year through QuestBridge’s National College Match Program, which is the next resource available to eligible students after QuestBridge’s College Prep Scholars Program. All QuestBridge scholars receive full four-year scholarships to the institution with which they match. The application process for QuestBridge scholars operates separately from the main college admissions process, working on a different timeline. Why QuestBridge, and what next? Under Macalester’s most recent Strategic Plan, approved by the BoT in January 2015, “increasing the diversity within our student body, faculty, and staff” was identified as a specific strategic priority. Along with the broader goal of increasing diversity, the Strategic Plan specifically proposed partnering with Questbridge or Posse — a similar organization — to increase diversity amongst admitted students. Gingras confirmed that the QuestBridge partnership is meant to be just one facet of Macalester’s overall effort towards this goal. “I know that it was an outgrowth of the Strategic Plan, the clause to increase the diversity of our student body…. There was a presentation by [Director of Admissions] Jeff Allen at the meeting this semester where we discussed QuestBridge, and that was the first time we had been engaged in a discussion of it,” Gingras said. The decision to pursue and solidify a partnership with QuestBridge came from Macalester’s Admissions Office and is seen by Gingras and Stüven — as well as the BoT’s Admissions Committee — as a first step in improving college access for socioeconomically and racially diverse populations. “QuestBridge definitely sounds like a rigorous program that allows students some really good opportunities that they might not get otherwise,” Stüven said. “When I first heard about QuestBridge, [I] was in a meeting with Jeff Allen. [I] had done a little bit of research beforehand, and I asked how many students we thought we would get—it was a surprise to hear that we will have eight per year. I think it’s an amazing thing for those individuals; I think QuestBridge is a piece of the puzzle,” Stüven said. Test-optional is one central initiative that both Gingras and Stüven mentioned as something impactful the college could do beyond QuestBridge to spark greater access to Macalester. “I think QuestBridge is an initial commitment by Admissions that shows to me they are really serious about [increasing diversity] and trying to find ways to do so. I think there are bigger structural changes that could happen, and test-optional has come up in a lot of conversations,” Stüven said. For Stüven, especially as the President of Macalester’s student body, there is a host of issues that need to be addressed pertaining to available resources for underrepresented students once they are on Mac’s campus. “We need to make sure that we are serving the needs of all students, which is especially difficult because all students are not represented on MCSG. I think a great example of that is the Open Pantry project; that just getting here isn’t enough — there are students who don’t have the resources to buy groceries — we are definitely under-providing in some areas,” Stüven said. “I think because we are creating the situation [of students with less resources and privilege being admitted to Mac] that it is the responsibility of the college to provide and create a successful experience for students who don’t come in with the same resources as other students,” she continued. In the meantime, though, Macalester continues to strive towards its aspirational goals of increased student body diversity and better retaining underserved populations, with student representatives and advocates like Stüven and Gingras playing an important role. The pair had a chance to introduce — and explain — the idea of test-optional to the Admissions Committee during its meeting this semester, starting a conversation on the topic that will hopefully be taken up again next spring. Gingras also mentioned that it seemed many committee members had never before heard of test-optional, so they had an opportunity for education. “I don’t think we went in with the intention of getting test-optional to be Mac’s policy, but bringing it to the attention of the board was something we wanted to do. Merrit and I were given a substantial amount of space to talk and share our own positions: that test-optional has the potential to increase the diversity of our student body. The discussion was tabled, and we hope that when the committee convenes again in the spring, we can discuss it again,” Gingras said. 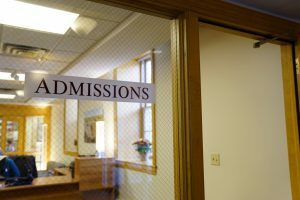 The ultimate idea Stüven hopes the Admissions Committee and Macalester can continue to wrestle with, though, is one of what the Mac experience is like for students who face the disadvantages that many QuestBridge scholars—as well as students already on campus—may face. “What is the idea of an equitable college experience? What does that mean to students and how do we help students have that experience?” Stüven said.